My button is bigger than yours. President Donald Trump, reacting to North Korean leader Kim Jong Un saying he had a "nuclear button on his desk" and was ready to use it against the United States, said on Twitter late Tuesday that his own nuclear button "is a much bigger & more powerful one than his, and my Button works!" In a televised speech Monday, Kim had said: "The entire United States is within range of our nuclear weapons, and a nuclear button is always on my desk. This is reality, not a threat." While Trump boasted about his "nuclear button," the president doesn't actually have a physical one. The process for launching a nuclear strike is secret and complex and involves the use of a nuclear "football," which is carried by a rotating group of military officers everywhere the president goes and is equipped with communication tools and a book with prepared war plans. If the president were to order a strike, he would identify himself to military officials at the Pentagon with codes unique to him. Those codes are recorded on a card known as the "biscuit" that is carried by the president at all times. He would then transmit the launch order to the Pentagon and Strategic Command. The fiery rhetoric comes as representatives from North and South Korea could meet for the first official discussions between the neighbors since 2015 ahead of the Winter Olympics in PyeongChang. South Korea proposed Tuesday that talks be held next week. A spokesman for the South Korean government said Seoul had consulted with the United States and had Washington's go-ahead. South Korea's overture was in response to comments made by Kim in a New Year's Day speech. He suggested immediate talks with Seoul over sending a delegation to the Olympics. The U.S. ambassador to the United Nations, Nikki Haley, warned North Korea earlier Tuesday against staging another missile test and said Washington would not take any talks between North and South Korea seriously if they did not do something to get Kim to give up his nuclear weapons. Sanctions and “other” pressures are beginning to have a big impact on North Korea. Soldiers are dangerously fleeing to South Korea. Rocket man now wants to talk to South Korea for first time. Perhaps that is good news, perhaps not - we will see! Haley told reporters that the United States was hearing reports that North Korea might be preparing to fire another missile. "I hope that doesn't happen. 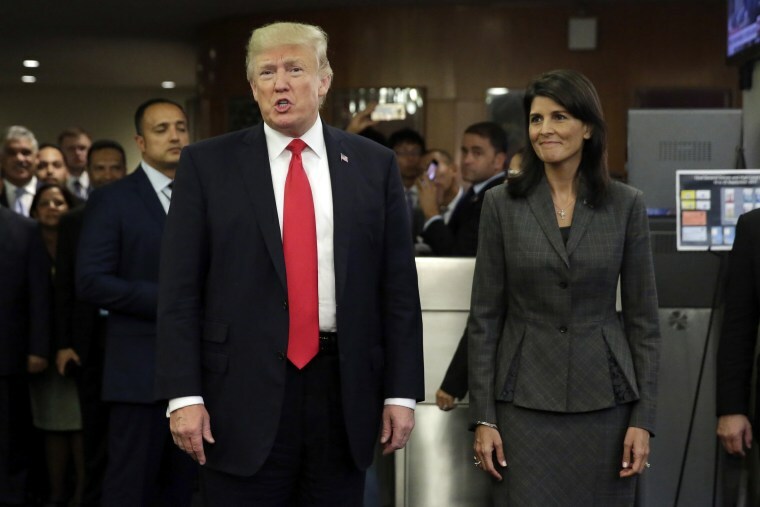 But if it does, we must bring even tougher measures to bear against the North Korean regime," Haley said. In September, North Korea conducted its sixth and most powerful nuclear test. Pyongyang tested a total of 23 missiles in 2017, including 15 that were nuclear-capable. The November launch of what appeared to be an intercontinental ballistic missile flew farther than any of Kim's previous tests — and the North claimed it could reach anywhere in the mainland United States. However, analysts say that based on the current evidence it's hard to prove or debunk North Korea's claim that it can now hit faraway American targets such as New York or Washington. Trump's tweet across the bow Tuesday evening was part of a barrage of New Year's posts chastising Iran, Pakistan and the Palestinian leaders. Hasani Gittens is a Senior News Editor at NBCNews.com. Gittens, a WNBC veteran, joined NBCNews.com in January 2013. Before that he worked at The Daily — News Corp's short-lived "iPad newspaper" — where he spent two years also as a news editor. Prior to that, he worked at WNBC as the managing editor of the station's website, and even longer ago he spent eight years as a reporter and eventually an editor for the New York Post. Gittens lives in Queens, New York.